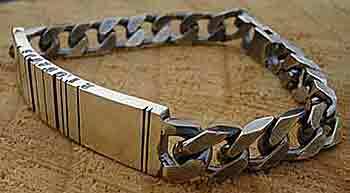 MEN'S SILVER ID BRACELETS : LOVE2HAVE in the UK! The Best! British made men's silver identity bracelets all handmade in the UK at prices you can afford. Type into google ‘ID bracelets’, and you will come across mainly the standard plain silver style bracelets again, with a very standard silver chain. All very dull and predictable we think. Our silver ID bracelets, on the other hand, are something very different indeed. The designers have gone the extra mile to produce something extraordinary with an eye for the unusual combined with sleek designer styling. Everything about these bracelets is very alternative from the norm, from the chains chosen to wrap around your wrist, to the unique ID bars that can even be individually personalised.